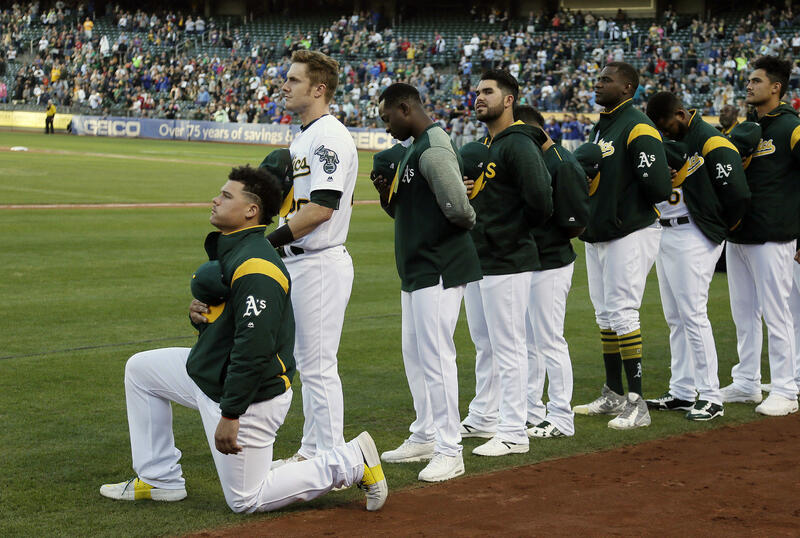 OAKLAND, Calif. -- Bruce Maxwell of the Oakland Athletics has become the first major league baseball player to kneel during the national anthem. Maxwell's protest comes after President Trump denounced protests by NFL players and rescinded a White House invitation for NBA champion Stephen Curry in a two-day rant that targeted top professional athletes. "That's a total disrespect of everything that we stand for," Mr. Trump said of kneeling through the anthem. He added, "Wouldn't you love to see one of these NFL owners, when somebody disrespects our flag, you'd say, 'Get that son of a b--- off the field right now. Out! He's fired." League executives and star players alike condemned Mr. Trump's words on Saturday, and Maxwell predicted on Twitter that athletes would begin kneeling in other sports following "comments like that coming from our president."